The inter-clubs were in the main organised by the clubs concerned and were often annual fixtures – for instance Clydesdale Harriers always had track matches with Vale of Leven, Greenock Glenpark Harriers and Springburn Harriers with others (Shettleston, Victoria Park, Maryhill, etc) being less frequent. They should not be looked back on in a patronising fashion – they were far from being easy, wee social occasions – although there was always a social element present. I have printed the results of the first one here had 16 events, including almost all field events, and others had eighteen events on the programme. Bear in mind that they required all the hurdles on the track for both hurdles races, the uprights and other kit for the high jump and pole vault plus all the throwing equipment to be present and in a good condition and that track events usually went up to 6 miles and had both relays.. They were not contested solely by B string or C string athletes – note some of the names below – SAAA champions such as Ming Campbell, Joe Connolly, Tom McNab, Peter Milligan, Alan Dunbar, Mike Hildrey and so on all appeared in them. Arranged before the season started, these matches were often written in to the competition before the season began. This is just a sampling of the fixtures – those from the East Coast are not here, nor are many of the local meetings in the counties around Glasgow such as Dunbartonshire, Lanarkshire, Renfrewshire or Ayrshire. Not all results have been printed. If you want any particular set added, it can be done. Here we go. 100 yards: D Robinson (S) 10.7 sec; 220 yards: A McGaw (B) 22.9 sec; 440 yards: R Cairney (B) 51.6 sec; 880 yards: B Forrest (B) 2 min 9.3 sec; Mile: B Dickson (B) 4 min 32.3 sec; Three Miles: J Connolly (B) 14 min 21.8 sec; Six Miles: J Irvine (B) 31 min 7.1 sec; 120 yards hurdles: G Brown (B) 16.6 sec; 440 yards hurdles: Brown, 60.6. Monday, 1st May: Shettleston Harriers won a triangular match against Seaforth AC and Garscube Harriers with an aggregate of 89 points to 66 for Seaforth and 36 for Garscube. J Meggat and T McNab (Shettleston) had doubles in the 100 yards and 220 yards and the long jump and shot putt respectively. Results: 100 yards: J McNulty (SH) 10.4 sec; second race: J Meggat (SH) 10.5 sec; 220 yards: W Stockton (SH) 23.6; second race: Meggat (SH) 23.6 sec; 440 yards: J Baird (SH) 53 sec; second race: J Wilson (SAC) 53.2 sec; 880 yards: J Young (SAC) 1 min 58 sec; Mile: J Davidson (SAC) 4 min 35 sec; Three Miles: I Donald (SH) 15 min 7.8 sec; High Jump: A Santini (SH) 5′ 3 1/2″; Long Jump: T McNab (SH) 19′ 5 1/2″; Shot Putt: McNab (SH) 36′ 10 1/2″; 4 x half lap relay: Shettleston 1 min 17.2 sec. Friday, May 6th: “Shettleston Harriers will meet Edinburgh University in what should be a very closely contested men’s inter-club match at Barrachnie. 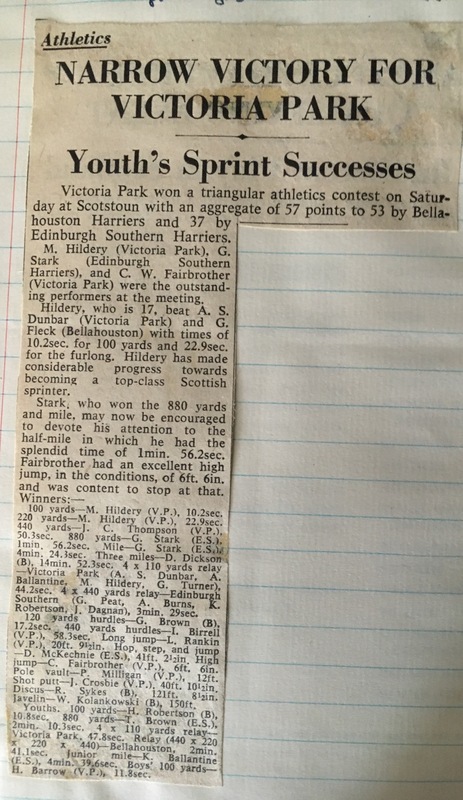 Wednesday, 11th May: “Bellahouston Harriers beat Victoria Park by 82 1/2 points to 78 1/2 points in an inter-club contest last night at Nethercraigs. G Brown (Bellahouston) won both hurdles events, the 120 yards in 12.1 seconds and 440 yards in 57.4 seconds, and RC Sykes (Bellahouston) won the shot putt with 39′ 11″and the discus with 112′ 10″. In the high jump, C Fairbrother (Victoria Park) cleared 6’6″ but failed at three attempts at 6’8″. Wednesday, May 18th: Glasgow University narrowly won an inter-club contest at Westerlands last night with an aggregate of 79 points. Victoria Park AAC were runners up with 74, Jordanhill Training College third with 52, and Shettleston Harriers fourth, 38. CW Fairbrother (Victoria Park) the British high jump champion, was one of the outstanding competitors with a jump of 6′ 7″, only half an inch outside the Scottish record. G McLaughlan (Victoria Park) equalled the 120 yards native hurdles record with a time of 15.3 sec. Monday, 23rd May: Edinburgh Southern Harriers beat Victoria Park AAC by two points at Fernieside. Six ground records were broken and one equalled. Bellahouston Harriers beat Ayr Seaforth by 71 points to 45 at Ayr.